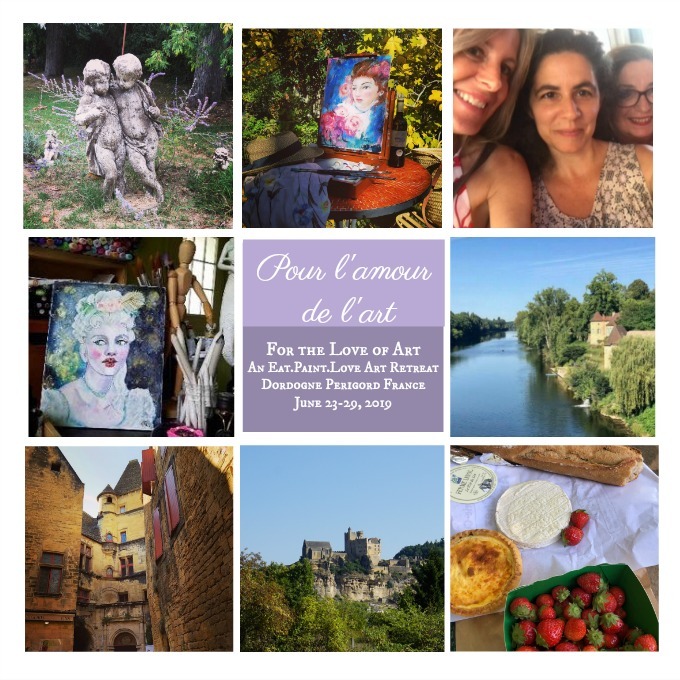 We love painting, we love travel and friendship, and we love great food too! 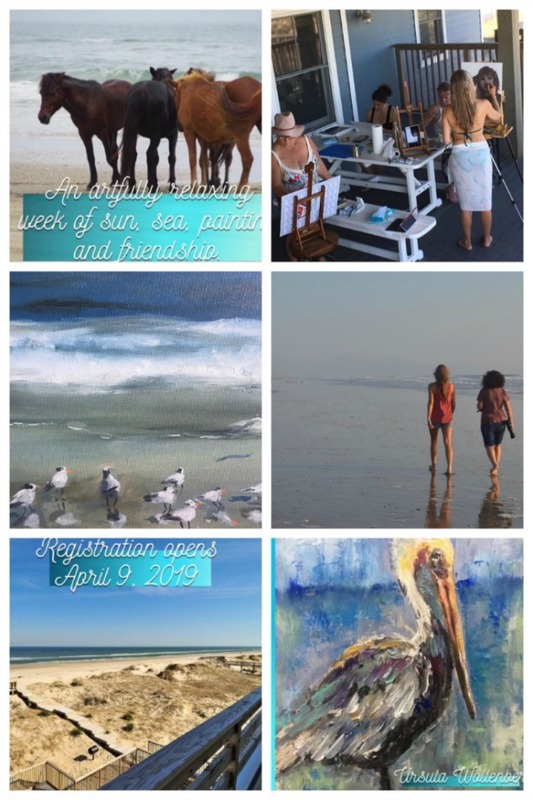 Join us for one of our women's art retreats and explore beautiful locations, paint and play with new and old friends and enjoy delicious local cuisines and healthy meals prepared with love. With artists and teachers Kelly Berkey, Marie-Laure Delage Carlson, and Christa Thomas, along with fabulous guest artists, we provide exploration of various techniques and mediums in a warm and welcoming environment. We keep our groups small, so we can provide individual attention and support when needed. Our women's art retreats provide the perfect balance of art time and play time. Time for relaxing, time to explore local sights, time to build friendships and memories to last a life time. Join us for a sunny week at the beach! At the northern end of the Outer Banks of North Carolina where the pavement ends and the fun begins. We will four wheel drive on the beach to our ocean front beach house for a week of art and friendship along the shore. This unique area is a protected home for a herd of wild spanish mustangs who have lived here for nearly 500 years. The horses can be seen daily on the dunes and down by the water's edge. We will be on the look out for dolphins, deer, osprey, and maybe a sea turtle nest ready to hatch! We are so excited to host our first guest artist, Ursula Wollenberg! 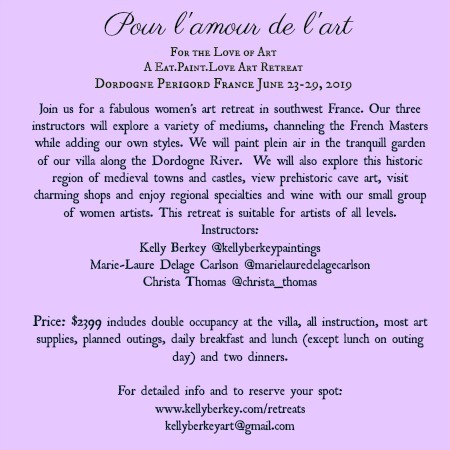 She will join Mari-Laure Delage Carlson and Christa Thomas for a week of art lessons using various mediums including oils, acrylics, pastels, and watercolors. We will be so inspired by the natural beauty around us as we paint! This will be our third time returning to this lovely beach house, which sits just behind the dune line facing the Atlantic with stunning views. Beautiful sunrises and sunsets, fresh ocean breezes, and the music of the waves await. Our house includes a pool and hot tub, a shady hammock, wifi, and charming beach decor. We provide all meals, prepared with love and locally sourced seafood and produce. We have a lovely massage therapist who will come to the house if you need some additional pampering (extra fee applies). 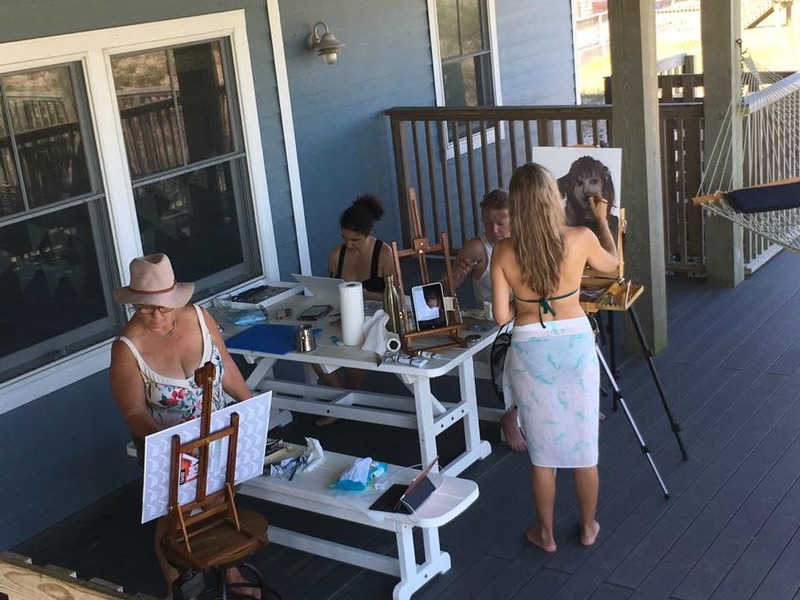 There will be plenty of time to paint and also to relax on the beach or by the pool or tuck yourself into a quiet corner to read or take a nap in the hammock. Cost of the retreat is $1495, which includes double occ (shared room with private bath), all meals, most art supplies, art instruction. Payment plan is available. 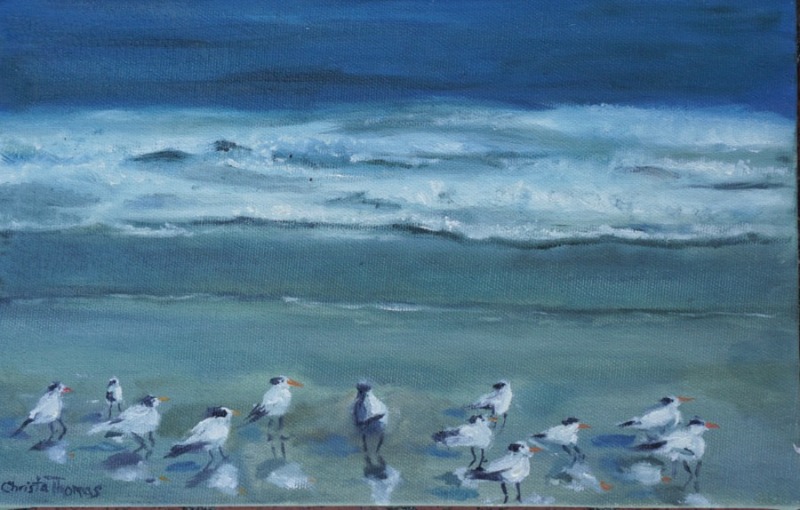 This item is for PAYMENT IN FULL for the Wild and Free OBX Art Retreat 2019. For the PAYMENT PLAN, please scroll through Art Retreats for the DEPOSIT payment tab. $1495 includes double occupancy shared room with private bath, art instruction and most art supplies, and all meals. Travel to the town of Corolla North Carolina is not included, but a shuttle from Corolla to/from our beach house on the 4x4 beach will be included. The nearest airport is Norfolk Virginia (ORF). We recommend sharing a car service with other retreat guests from ORF to Corolla. In the shopping cart, please select "art retreats, no shipping" under shipping options. For Wild and Free OBX 2019 there is a nonrefundable cancellation charge of $250. If you need to cancel your registration for any reason, the remaining registstration fees that have been paid up to Aug 1, 2019 may be refunded within 14 days of notification via email to christathomasstudios@gmail.com, less the $250 cancellation fee. After Aug 1, 2019, there are no refunds for any reason, unless the event is cancelled by the organizers including cancellations due to unforseen reasons including illness, natural disasters or other major events preventing the event from going forward. In this situation, we will notify you as soon as possible and refunds will be issued within 14 days of notification. 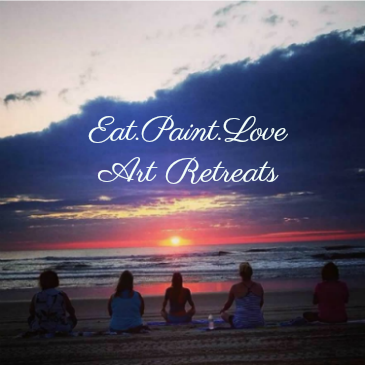 We (Christa Thomas Studios, Kelly Berkey Art, Marie-Laure Delage Carlson, Ursula Wollenberg, and Eat.Paint.Love Art Retreats) are not liable for any expenses incurred for cancelled flights or any travel or other related expenses. If you need to cancel after Aug 1, 2019, you may be able to transfer your reservation to another artist. 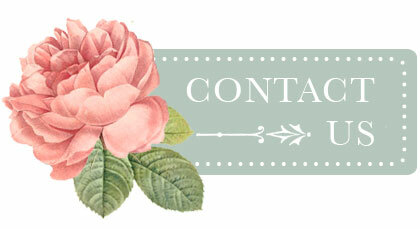 If we have sold out and have a waiting list, we will help you contact persons on the waiting list. We make every effort to carry out the program as planned, but may substitute or modify the itinerary as needed based on availability of vendors, instructors, supplies and weather or other issues that may arise. We strongly recommend that you purchase travel insurance which would help you recover any expenses related to travel, emergency medical evacuation, baggage loss and workshop costs. $1495 includes double occupancy shared room with private bath, art instruction and most art supplies, and all meals. Travel to the town of Corolla North Carolina is not included, but a shuttle from Corolla to/from our beach house on the 4x4 beach will be included. The nearest airport is Norfolk Virginia (ORF). We recommend sharing a car service with other retreat guests from ORF to Corolla. ©2009 - 2019 Christa Thomas Studios. All rights reserved.